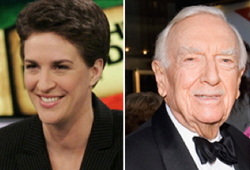 Rachel Maddow will receive an award named after Walter Cronkite. The Interfaith Alliance announced Monday that it would award its 2010 Walter Cronkite Faith & Freedom award to the MSNBC anchor in honor of her work covering religion and politics. Maddow will receive the award alongside Chautaqua Institution Department of Religion Director Rev. Dr. Joan Brown Campbell. The award, which will be presented at a gala dinner in New York in October, “recognizes individuals who courageously promote democratic values, defend religious freedom and reinvigorate informed civic participation,” according to the announcement. Cronkite served as Honorary Chairman of the Interfaith Alliance until his death last year. Previous media recipients of the award include Peter Jennings, Tom Brokaw, Larry King, and Bill and Judith Moyers.